Observations on pre-emergence, single-foundress colonies of Japanese paper wasps (Polistes) revealed that there was a latitudinal gradient in intensity of application of an ant-repellent substance (secreted by the metasomal sternum VI glands) to the nest petiole. Thus the lower the latitude, the more frequently a foundress rubbed ant repellent onto the nest petiole. 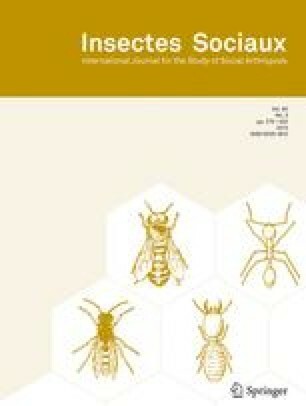 Estimation of potential ant predation on wasp brood using bait traps showed that there was a positive correlation between the frequency of rubbing and potential predation pressure from ants which are guided predominantly by substrate cues for foraging. There was also a latitudinal gradient in the degree of temporal association of rubbing behavior with foraging: the lower the latitude, the more closely foundress departure from the nest was associated with rubbing. Enlargement of the nest petiole by applying oral secretion potentially obliterated previous coats of ant repellent; however, this behavior was not always followed by rubbing behavior. The ant-repellent chemical barrier around the nest petiole may have evolved in tropical regions of the world as a defense against ant predation on wasp brood. I argue that as ant predation pressure diminishes towards the cooler regions, so does selection maintaining the behavioral sequence where foundress departure from the nest is preceded by rubbing behavior.